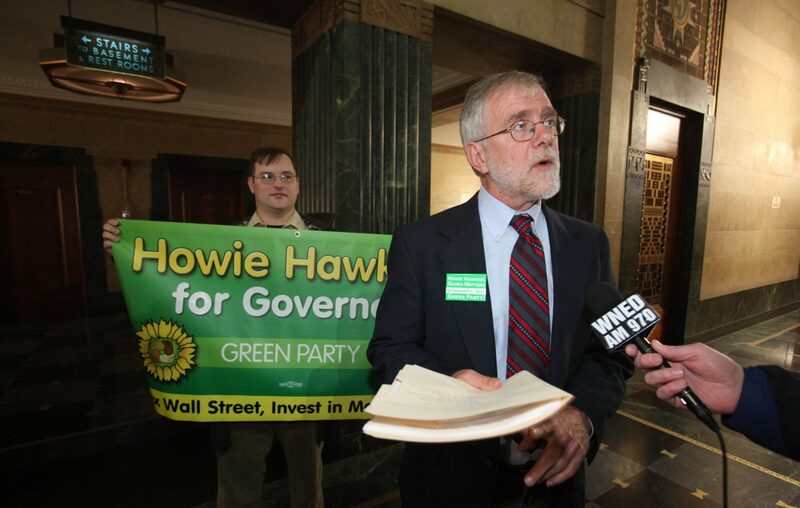 At its state convention in Rennselaer on Saturday, the Green Party nominated Howie Hawkins for governor, Jia Lee for lieutenant governor, Mark Dunlea for comptroller and Michael H. Sussman for attorney general. Hawkins, a retired Teamster from Syracuse, will be making his third consecutive run for governor. He received 5 percent of the vote in 2014 and is a co-founder of the Green Party in the United States. Lee is a public school teacher and UFT chapter leader in New York City. She is a leader in the Opt Out movement and active in the Movement of Rank and File Educators. Sussman is a prominent civil rights and environmental lawyer and is from Goshen. Dunlea is from Poestenkill and is an anti-poverty activist. The Green ticket will campaign for single-payer health care, 100 percent clean energy by 2030, fully funded public schools, legalization of marijuana and public campaign finance.